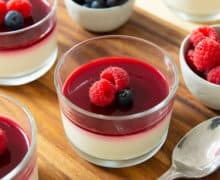 This creamy Panna Cotta is a great make-ahead dessert that’s simple to make, and pretty enough for a special occasion. Because Panna Cotta is so often served at restaurants, it’s easy to think of it as complicated or fancy. But it’s one of the easiest desserts you can make yourself. And because it has to be made ahead, it’s a great stress-free dessert for entertaining. All you have to do is pull it out of the fridge when you’re ready to serve. 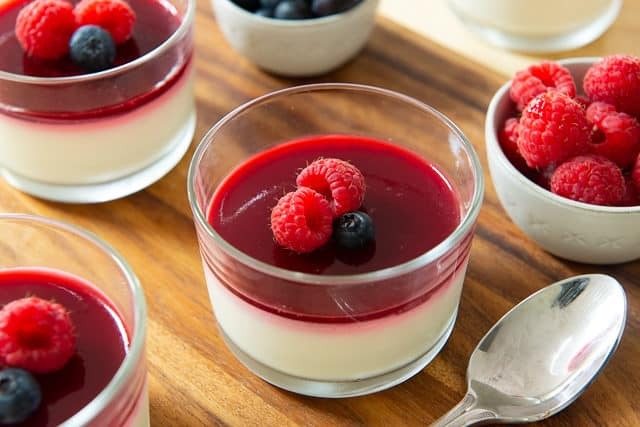 Panna Cotta is a creamy Italian custard that’s enjoyed cold. It’s traditionally set with gelatin, and can be served in glasses like I have here, or inverted onto a plate for a molded look. I think it looks beautiful in glasses, and then you don’t have to deal with the stress of inverting them perfectly. But, these can be inverted if you’d like. The panna cotta stays molded very nicely, while the raspberry sauce spreads slightly. This is called blooming, and ensures that the gelatin dissolves evenly. Heat for another 5 minutes or so, until the sugar dissolves. 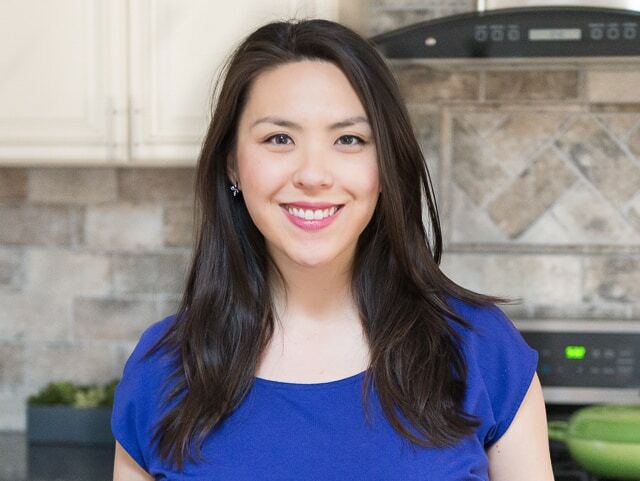 Let cool briefly at room temperature, then place into the fridge for 6 hours, to set. Return the glasses to the fridge for another hour, to allow the gelee to set. Blackberry Crisp, Raspberry Frozen Yogurt, and Fruit Pizza are some of my other favorite fruity desserts. Enjoy! 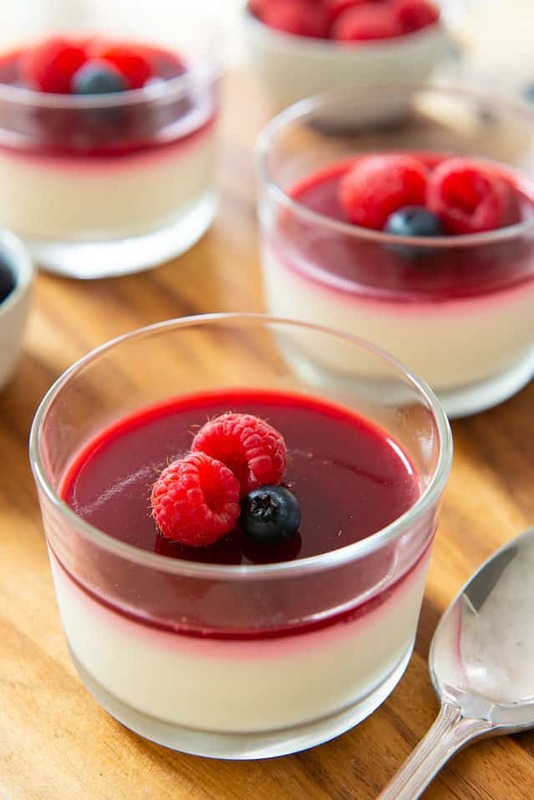 Creamy panna cotta is served with a bright raspberry gelee on top. It's a beautiful and delicious make-ahead dessert! 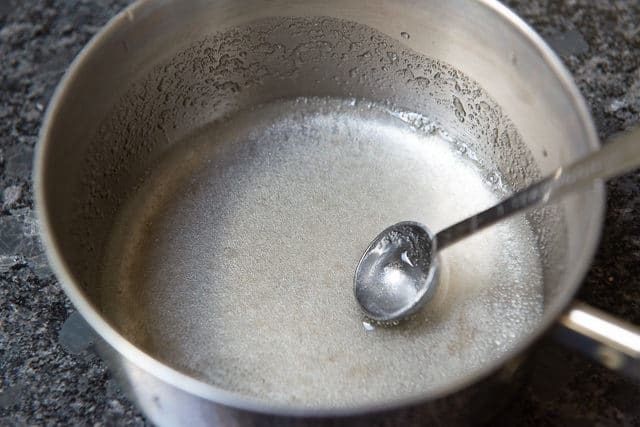 In a small saucepan off the heat, combine 1.5 tsp of the gelatin with the milk, and let stand for 5 minutes. This process is called blooming, and lets the gelatin absorb liquid and dissolve evenly later on. 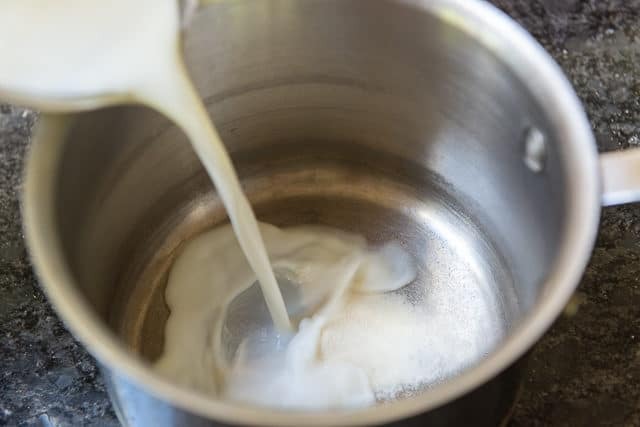 Set the pan over medium heat, and stir frequently for 5 minutes, until the gelatin dissolves, making sure you don’t boil the milk. Turn the heat down to medium low, if necessary. 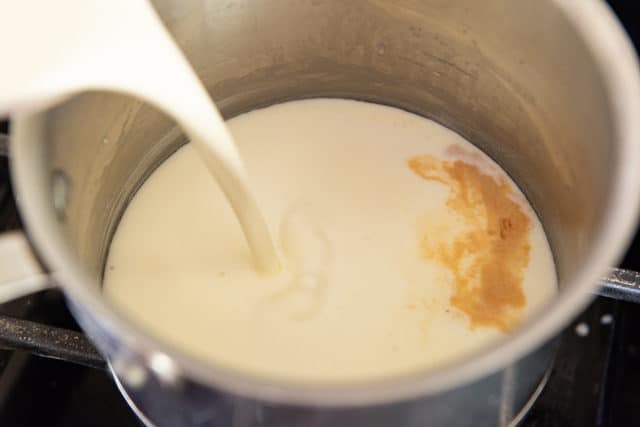 Add the heavy cream, sugar, vanilla, and salt, and stir for another 5 minutes until the sugar dissolves. Remove the mixture from the heat. 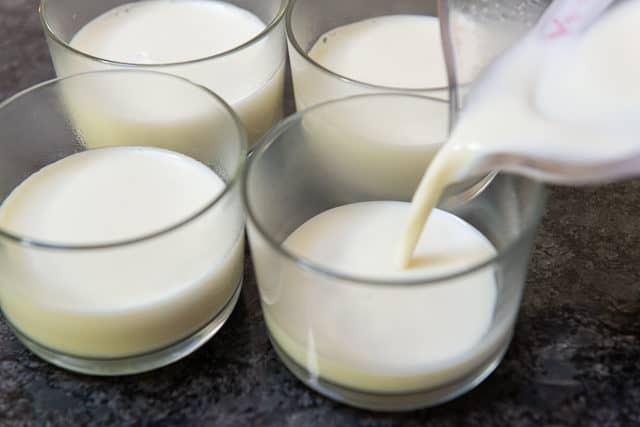 Evenly pour the mixture into 4 glasses or ramekins of your choice (4-ounce ramekins are a good size), and let cool at room temperature for 15 minutes. Then chill in the fridge for 6 hours to set. 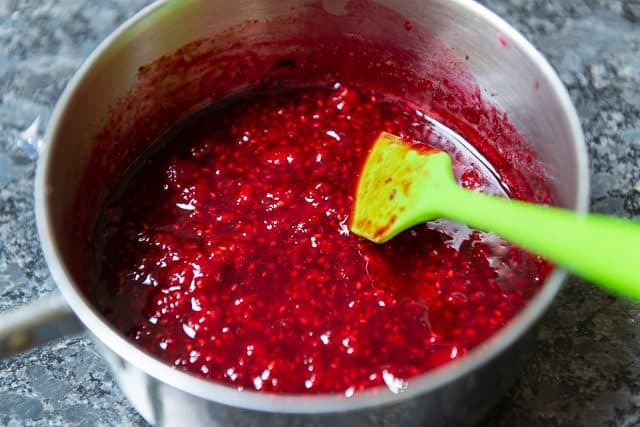 To make the raspberry gelee, in a small saucepan, combine the remaining gelatin with the water, and let stand for 5 minutes. 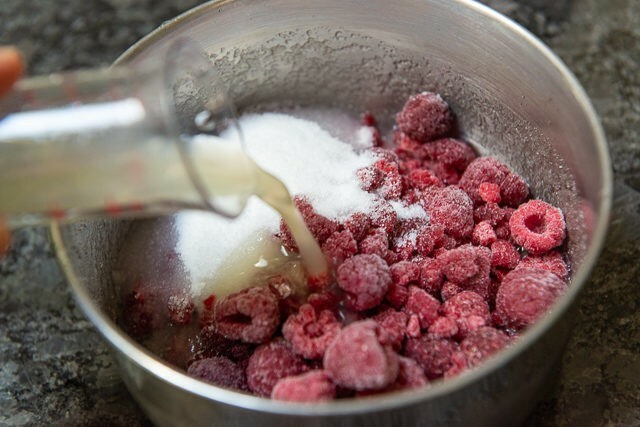 Add the raspberries, sugar, and lemon juice, then simmer for 5 minutes until the sugar is dissolved. 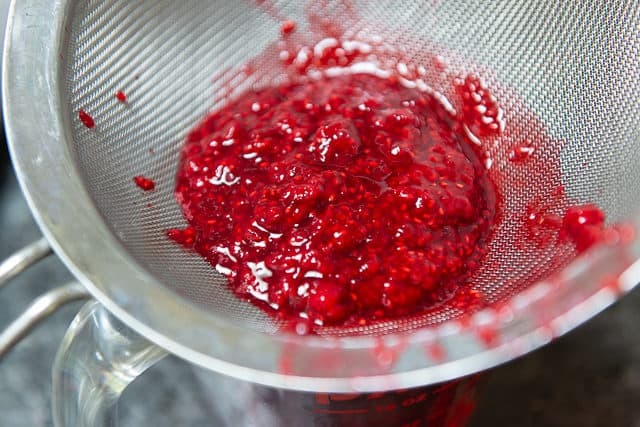 Use a fine meshed sieve to strain out the raspberry seeds. 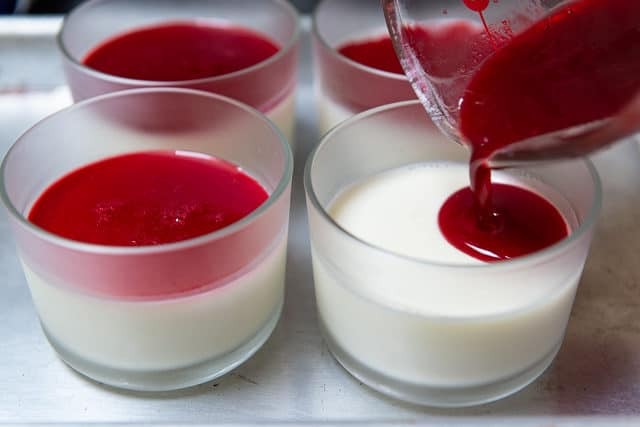 Let the gelee cool to room temperature before pouring evenly over the chilled panna cotta (if the liquid is hot, you’ll melt the panna cotta very easily). Refrigerate for another hour to set the gelee. If desired, serve with fresh berries, and enjoy! Post updated in February 2019. Originally published August 2011. What an absolutely fantastic dessert! 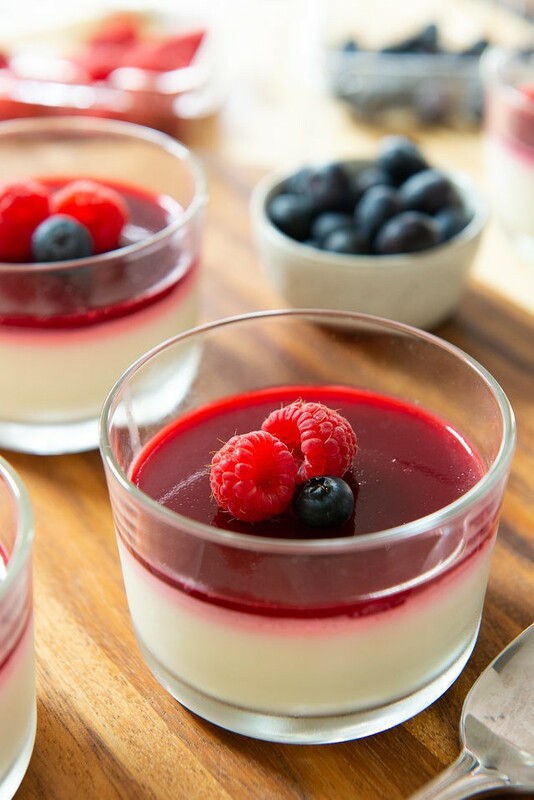 i LOVE panna cotta and the gelee – well – MARVELOUS! Thanks for sharing! I made it for my family and we all loved it! I used frozen blueberries because that is what I had in the freezer and was delicious. I love cooking your recipies because they always turn out great. By the way, there is no heavy cream where I live so I used normal cream (Schlagsahne) and it was perfect. How many grams or ounces of gelatine does an enveloppe contain? Thanks gor another beautiful recipe. what a lovely, silky version of panna cotta. the berries make the composition beautiful – and delicious too, I’m sure. Last time I made panna cotta, it didn’t gel very well. I’ll try this recipe next time for sure.